Having grown up in Australia, I never got to see much of the rest of the world until I was an adult. It’s not like you can jump on a bus and travel across the continent to see so many ancient cultures like you can in Europe. The most ancient civilization we have in Australia is that of our aboriginal natives and, while seeing where and how they lived and listening to their legendary stories of ‘dreamtime‘ is wonderful, it didn’t have the variety that could be found overseas. I often dreamed of visiting the places I saw in history books or connecting with the ancient spirits written of in stories, but money was tight and there were other priorities to attend to. Even then, it wasn’t until my 25th wedding anniversary that my husband and I decided it was time to at least go see the place where he was born. For ten months of his life, he was an Austrian. His dad was born in the now defunct country of Sedetenland (Bavaria) and his mum was an Austrian. Their love match was unapproved by his dad’s family and eventually they traveled across country to the Swiss border with the three kids they had already sprouted, birthed my husband in the border town of Hohenems, and then immigrated to Australia on a big ship (upon which my future mother-in-law spent a lot of time trying to prevent her children slipping out from underneath the deck railings into the wide blue sea. Apparently, they didn’t have the safety barriers they do now). Since we took out a mortgage on our home to pay for our trip, and because it was so far away, we decided to take in some of the lands I’d wanted to see for so long, as well – like Italy and Greece. 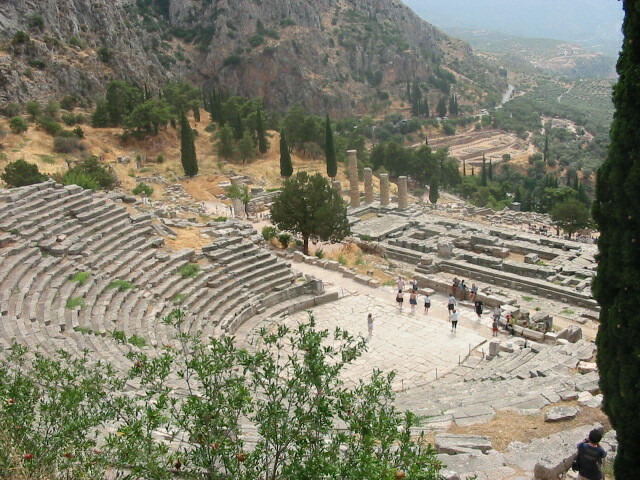 One of the places that thrived in many of the fantasy-adventure-historic novels I read as a young adult was Delphi. Having had experiences of my own of a prophetic nature, I was really interested in seeing the place where priestesses would reveal their oracles to those who asked. I was so excited about actually being in that place, and was sure I would feel a presence and a connection, just as I had often felt such things in places in Australia, man-made or natural. Our trip to Europe was wonderful and glorious, and full of history, color, and texture, but in the main the only spirit I felt throughout our travels was that of human beings, alive and thriving. (I had an experience at the tomb of St. Francis of Assisi, but that is another story). When we did get to Delphi, the ruins were amazing, but not for any life in them (apart from the plants taking root) – for the mark that people leave behind them. I did see the place where the priestess gave her oracle – an overgrown rock that once had sulphuric gasses leaking out from a long crack over which the priestess sat. To a degree, it was disappointing to me that the priestess needed a stimulant to produce her oracles, though I knew that many spiritual cultures around the world used stimulation of one form or another to produce shamanic vision. The rock didn’t even have a temple surrounding it any more. (Although it did have modern scaffolding around it on the day we visited, as Greek ruins are always in a long process of management and excavation). So I was brought to reality with a thud. The romance in the novels I’d read had done what they were supposed to do – stimulating desire and inspiration – but faced with the current facts, I felt somewhat let down. That was, until I looked out onto the view. What an absolutely amazing place to build a city of temples, so high in the mountain with the shimmering air hovering over the valley. The hillside snakes with stone steps that lead to everything. I’m sure the ancient inhabitants must have been very fit. There were lots of other temples in Delphi, and not just the rock where the priestess sat. It was a thriving religious community and pilgrims came from far and wide to worship. The steps now trod by modern tourists were trod by ancient tourists long ago, and shopkeepers thrived on commerce as much as they still do in places like the Vatican City, today. Amidst the expansive religious community buildings, a wonderful theater was a focal point. It was the most intact building in the place, with rows of stepped seats climbing the hillside. I wondered how anyone could focus on whatever played there, with such views forming a backdrop behind the stage. The beautiful valley below Delphi was also once full of a bustling tourist city (yet to be excavated), full of accommodation choices for weary travelers. In the end, it was these elements that re-inspired the romance of Delphi for me. Not the ancient priestesses who had long taken their spirit into the ‘otherworld.‘ Instead, it was the markers of bustling, thriving human life, and the knowledge that people are still doing the same things, thousands of years later – praying, hoping, wishing, making money, capitalizing, providing, gathering, eating, drinking, surviving, and having fun. I came away from Delphi and all the other ruins we saw on our travels, (and even from the modern cultures we experienced along the way), with one thing in mind. I felt a great respect for the human race. Listening to the different languages in different countries, yet watching similar lives play out in each, I was impressed that often the only differences between humans across the planet, modern and ancient, is their language, the names of their gods, their clothes, the food they eat, and the places they live in. In all, across the breadth of time, I saw the wider view of their adaptability, their flexibility, their persistence, and their ability to reform, reshape, and survive whatever wears them down. People are indomitable.